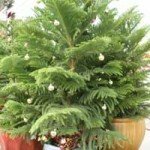 Instead of a Christmas tree some may opt for a Norfolk pine (Araucaria heterophylla)which is usually available in stores before Christmas. It may be sold plain or decorated to serve as an alternate mini Christmas tree for those with little space… (Read More). 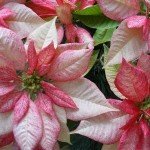 For longer bloom during the holiday season place your poinsettia in bright diffused light, away from heating vents (hot dry air) and cold drafts. The cool night temperatures will extend blooming time. Keep the plant evenly moist as moisture fluctuation, cold/hot drafts can cause premature leaf drop. When watering, be sure to slip off the decorative foil cover or punch a hole in the cover to drain the excess water. 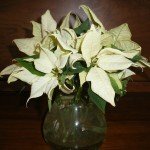 Once your poinsettia survives the holiday season it can be encouraged to rebloom next year. 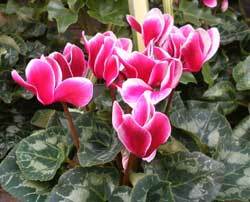 Cyclamen The florist variety of cyclamen (C. persicum) was ‘the plant’ during the Christmas holiday in the Victorian era. 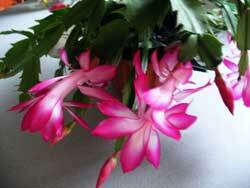 Christmas cactus offers a profusion of tubular flowers that bloom for two to four weeks around Christmas time. 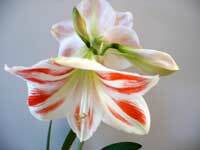 Amaryllis – great bulb forced to bloom at Christmastime or indoor Winter bloom. Many bulbs kits are available starting in the fall that have all the necessary items needed. 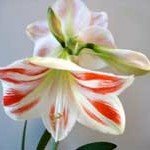 It usually includes pot, potting soil mix and the bulb along with planting instructions or you can purchase bulbs online from several sources. 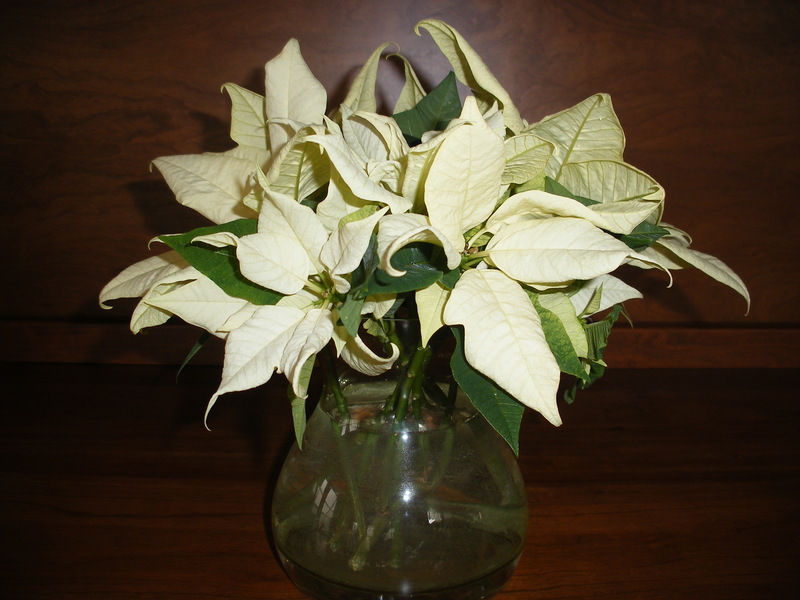 If your poinsettia plant drops its leaves but you still have the colorful “flowers”. Make an easy vase arrangement. HI! WHAT ARE SEASONAL PLANTS??? 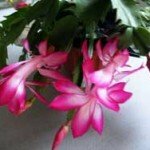 Plants that bloom at certain times of the season-spring, summer, fall and in warmer climates even winter . Mums, kale, pansies are seasonal plant that bloom in the fall. garden problems: leaves on tomatoes and beans:turning yellow. on tomatoes and lemon tree some leaves are curling. delphinium: leaves are dying on the edges. the edges are grey. The body of the leaf is still green but it’s happening all over the plant. Temp 95 and above. Too much water from watering then come thunderstorms.? How do you sweeten a pot and dry-out a deep one. What causes wilt? Thank you. I planted an Endless Summer Hydrangea last spring(red bloom) and it bloomed all summer. It looked so healthy and beautiful. It doesn’t have new green growth yet, should I be concerned about this or is this a later blooming hydrangea? Thank you for any comments! You don’t mention what kind of spring you had. If it was cold, perhaps it’s still waiting for the soil to warm up. Although, I think by this time you should see some new growth. Check the base of the plant to see if there is any new growth. If you don’t see any new growth by the end of May, then you should be concerned. I planted a hibiscus late summer in zone 7 (Oklahoma City area). It is about 4 ft tall. We’ve had our first freeze now and most of the leaves have fallen off the bush. How should I care for the plant over the winter? Should I water weekly when we’re not in a freeze? Would really love to see it come back in the spring. Your comments are appreciated. You don’t indicate what kind of hibiscus it is. Is it the hardy kind (Rose of Sharon-Hibiscus syriacus) or a Tropical hibiscus? If it’s a tropical hibiscus, it will die outdoors because it is hardy in zone 10-12. See http://hortchat.com/info/tropical-hibiscus for more info. I bought a bouganvellia that appeared dead, as it was dry, woody and brown with absolutely no green part to it whatsoever, however I was reassured that the plant would eventually bloom and that the appearance it had was completely normal (I live in the UK) for the time of year. Almost 2 months on and the plant has not changed at all. I suspect it is dead but perhaps I am incorrect or maybe there is something I can do to revive it. Any advice would be greatly appreciated. Bougainvillea will not start to grow unitl the weather warms up May/June. If it doesn’t respond at that time then its dead. I planted a bee balm in spring and I would like to know the best way to take care of it before winter so that I can enjoy it year after year. Thank you ! Bee balm (Monarda) doesn’t require too much care. You can either cut it down to about 3″ from the ground or leave it and let the birds enjoy the seeds thru the winter. In spring trim or remove all the dried stems and seed heads. Monarda can spreads easily and can become invasive in your flower bed, before you know it you will be pulling out clumps to give to your friends and neighbors. plants and putting them in pots around my yard. Now that it’s getting colder, I would like to keep them outside..but it does sometimes freeze here. Can I put them under my overhang by my house and keep them outside all winter? How nice to hear from you. You can keep your cactii under your overhang as long as they some sun. The basic minimum temperature for cactii is around 35-40F which causes them to go dormant for the winter. There are hardier cactii that tolerate much lower temperatures. To prepare your cactus for winter, gradually water less in the fall. The cactii will shrink or shrivel slightly and can even change color. This will make the plant cold hardy. Too much water will produce “soft tissue” which will be susceptible to cold damage. To be on the safe side, if a hard frost (20’s) is eminent cover your plants with a blanket, newspaper (no plastic) for extra protection. A friend was going to dig up some elephant ear bulbs from her yard for me this fall. I live in Newnan, Georgia. Her son decided to help and pulled them up this week, October 1st and they are laying her yard for me to come pick up. Please let me know what to do now. I was going to prepare a bed and plant them this fall, can I still do that or do I need to winterize them or plant them in a pot, or can I just put them with leaves in the ground now? Please help. Yes, you can plant them in your zone 8. 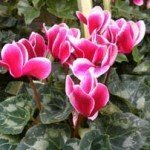 It is marginal in your area so to be sure that your elephant ear will winter over well give them a 6″ layer of mulch after a freeze to protect it from the cold winter. No, you don’t need another plant for pollination. Each plant will pollinate itself. The canes(vines) grow fast so be sure to train on on a fence or wall so they are easier to handle. Just trying to figure out what to do to make my hibiscus plant get flowers on it. It has wintered nicely. still tall and green. new leaves. but no sign of any buds. what could be the cause of this. and what do I do to make it produce flowers ?? Is it indoors or outside? It may need more sun exposure. You don’t mention fertilizer. Since it is putting on new leafy growth try a balanced fertilizer (10-10-10) or a higher potassium fertilizer during the summer. Hello, I need your help again. I had received a dwarf weeping peach tree. it is 5 or 6 years old. the height is the same… but I would like to know if there is a certain fertilizer you would recommend for the “limbs” or branches to grow on it. It still has the same amount of them as when I got it… Also when is the proper time to set out hanging geranium plants ?? thanks for you help.. The recommended fertilizer is the same as for any other fruit tree. Apply a balanced fertilizer 10-10-10 in early spring. Before bud break is the best time. Spread the fertilizer 2-3 ft from the trunk and extend out beyond the dripline. Set out your geraniums when day temperatures are 65F and night temps at 55F. IF the nights get too cool bring them indoors. Have a great spring! You may have a confederate rose (Hibiscus mutabilis). Some reason that they fail to bloom is: too wet, too dry, too much nitrogen (the 1st number) and too much shade. U. of Florida recommends: fertilize lightly 4x a year with a 15-5-10 or 15-5-15 with micronutrients. For large plants spread the fertilizer slightly beyond the dripline, 1/2 to 1 lb per plant in early spring, after 1st flush of growth, midsummer and September. Depending on the weather and temperatures, leaves can stay colored for several weeks. A hard freeze can cause leaves to drop earlier. Red maple (Acer rubrum) is so called because new growth – leaves and petioles are often red. It is one of the first trees to color in the fall-which can vary from greenish yellow to yellow to brilliant red. In order to assure good fall color you need to make sure that you have a cultivar of red maple such as “Autumn Flame”, “October Glory” or “Red Sunset”. 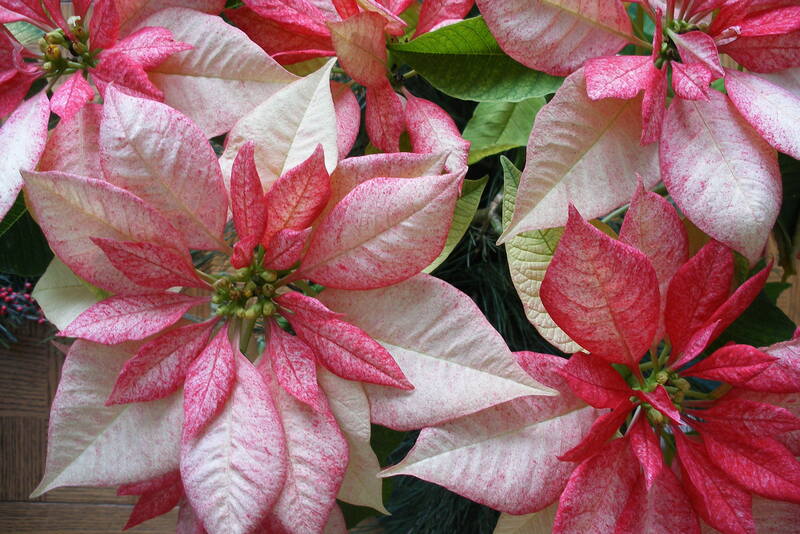 These are known to retain their leaves and maintain brilliant fall color longer.